Today we have a rather special bag. 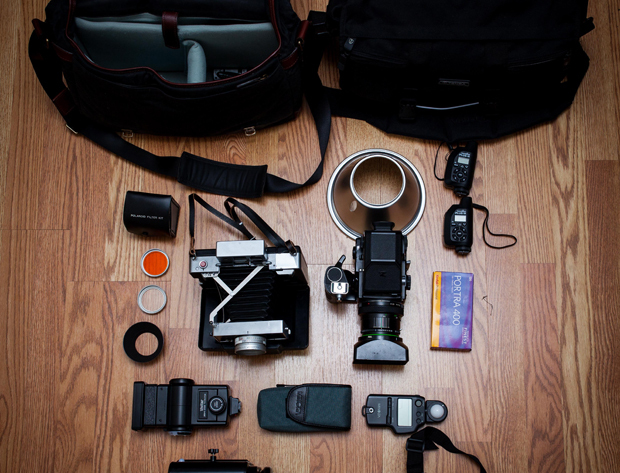 A glimpse inside the bag of the main man at the Phoblographer. Chris is a top guy and he agreed to share his personal setup with us. 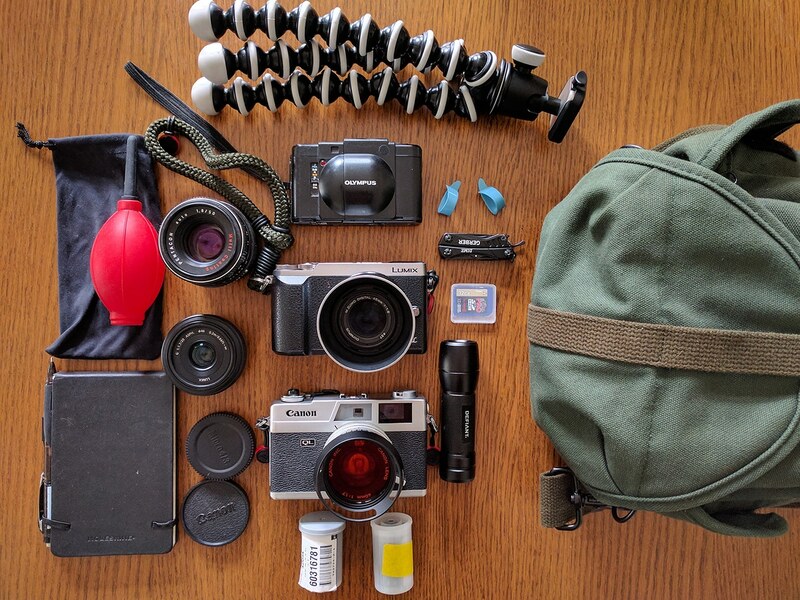 Come and have a look inside the bag of someone who reviews cameras for a living. Do you know why photography is so important to us? Because not only does it allow us to stop a moment and analyze it from so many different ways, but it allows us to fall in love with milliseconds of time. Human beings have an affinity for the nostalgic, the great moments, and the bad moments–and what aids our memory is photography. Every heartbreak, every smile, every time you and your friends go out at night and have a wonderful time that you would probably not remember otherwise is recorded in pixels these days amongst the mainstream audiences. But there are some of us that still have the strings that tug at our heart for good old film. 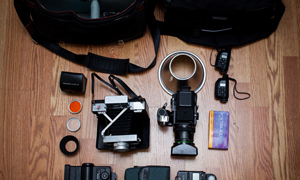 As the Editor in Chief of The Phoblographer, I deal with loads of cameras every month. They come, they go, I write, we publish, and the cycle continues. While I own my own digital cameras, the ones that make me happiest are my film cameras. They teach me to look at the world in a totally different way each and every time and they help me to keep my skills up. All of my commercial work is done digitally, but everything that is personal and close to my soul is film. Call me a hipster living in Brooklyn, or a hopeless romantic that practices an ancient technique, but film is still one of the most precious things in the world to me. 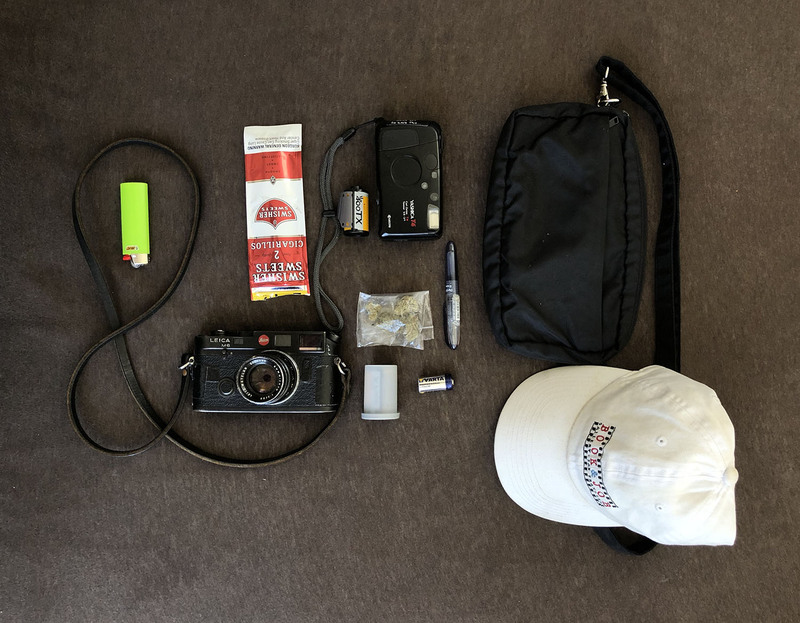 And the bag containing the creme de la creme of my analog obsession is the one that still reminds me that no matter how many images and products I review each day, there is still something about photography that is still just for me and not for lots of people who come to the site each day. 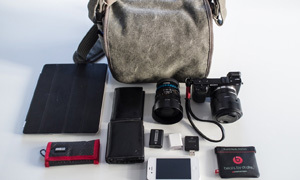 Let’s start with bags: my absolute favorite is the ONA Street Union Camera bag. Every two months, I carefully wax the bag using Otter Wax (and you can see me doing it here in my site’s NEX 5R review http://www.thephoblographer.com/2013/03/04/review-sony-nex-5r/). It is made of canvas and leather and has a beauty that illicits a feeling similar to what you feel when you encounter your first crush for the first time. With soft pockets inside, lots of padding, and a laptop sleeve, I really can’t often ask for anything more. The other bag is a Tenba Large Messenger Bag: which often holds my studio lights–I’ll get back to that more later on. You’re all here for the cameras afterall. My primary film cameras are the Polaroid 185 Land Camera and the Bronica ETRS. The Polaroid came from a summer’s long hunt to find one in perfect condition. And though I paid almost $500 for it, I found out that it was well worth the money. The owner of the legendary Nippon Camera Repair company here in NYC personally refurbished the camera and cleaned it up–and for that kind of service for a timeless item, I’d be willing to fork over even more. The camera has a large bellows and a fully working shutter with manual aperture and shutter speeds. But to take the most advantage of the camera, I often need to put the UV filter and the lens hood on. Those were also purchased off of eBay. Oh right! And the camera shoots 3×4 instant film: I typically stick with the Fujifilm stuff. Then there is the Bronica ETRS with a Metered Prism, Speed grip and 75mm f2.8 lens. When in the daylight and wanting to shoot wide open, I often put a Fader ND in front of the lens to cut down excess light. Lastly, there is usually a whole box of Portra 400 in the bag as well. One day during the winter, I wandered onto a large bed of ice to set up a tripod with this camera. My boots didn’t have that much grip and I didn’t think about wanting to go out onto ice. I got the shot, but as I was coming back, I slipped and fell. The camera took a big tumble and the entire thing came apart. Luckily, I had the dark slide in and I was able to put it back together with no problems except for a dirty prism (which I cleaned) and then a scratched focusing screen. When I told a buddy later, he told me that those cameras are the white trash of the industry–they can take a beating and just keep coming back. Then we get to the most important part of the film process: my accessories. Before I go on, I want to warn you all: don’t ever get into lighting with all your perseverance and tenacity. You’ll become addicted like a fat kid loves bacon. And with that said, I sometimes bring an entire other bag just for my lights. My main light is an Einstein E640 with 640 watt seconds of power. That’s usually more than enough and I barely ever need more power. I usually use it with an umbrella reflector and either point it at walls/ceilings or bring an umbrella. But sometimes, I only need a little kicker. For moments like that, the good old Vivitar 285HV is all I need. The flash has variable power settings based on ISOs, and apertures, and it is easy to figure out how much light you really typically need. 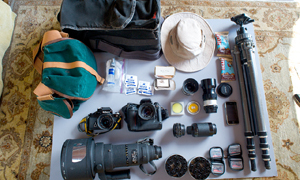 To trigger these strobist items, I use Pocket Wizard Plus III radios. I almost never use the flash in the hot shoe: and the Polaroid doesn’t have one. However, it has a PC port so I often hook the Polaroid up to a Plus III using the necessary cord. He had his money an hour later. And while I love the look of natural light, I’ve learned while living in a big city that it isn’t always reliable–even more so because of said big city. So my thing is to create my own. I’ll often try to mimic the look of natural light, but I also know when not to for my own personal vision. I hope this didn’t bore you too much, and if you like this entry in the series, I strongly encourage you to come visit us at The Phoblographer. We’ll be waiting. 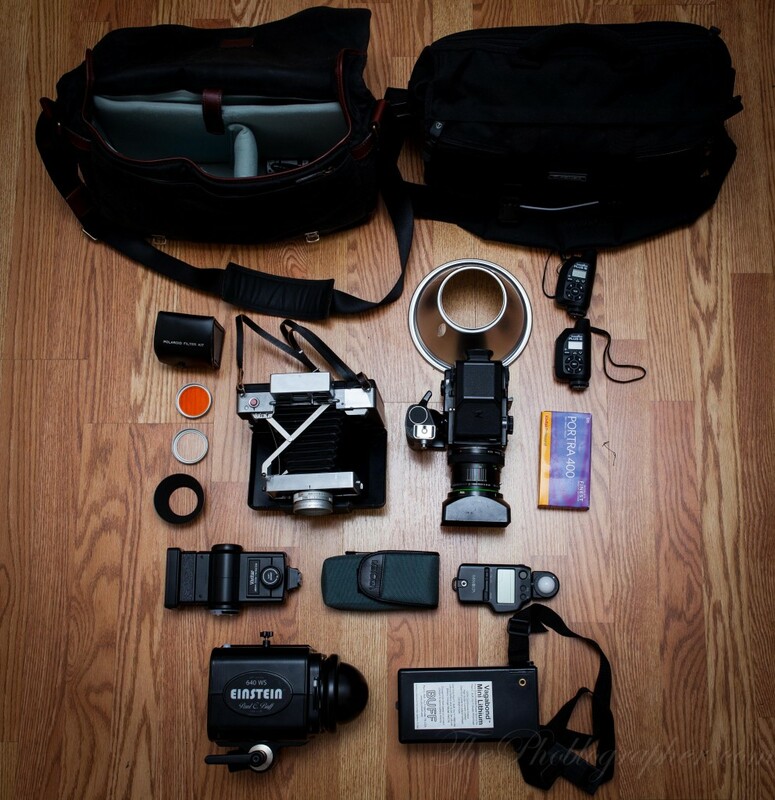 Thanks Chris for sharing your bag with us, it is cool to see what you actually shoot with. Thanks for all of your support over the past year too, I am very happy to see you on here. this is genius in its idiosyncratic way. The manual polaroid cameras are a dream to use. And it’s nice to see I’m not the only one using them.